Find out what our experts have to say about Honda Shine! The least priced variant is Honda Shine Drum Brake priced at Rs. 66,367 and the most priced variant is Honda Shine Disc CBS priced at Rs. 73,481. Choose the Honda Shine which fits the bill of you. The Indian motorcycle market is evolving at a rapid pace. There are multiple brands in various different categories competing to get a chunk of one of the biggest two wheeler markets across the globe. However, it is the commuter motorcycle segment that leads the sales volume charts. And amongst the best sellers of this segment is the Honda CB Shine, a 125cc motorcycle that sells close to 1 lakh units every month. So, what makes this Honda motorcycle shine so much? We try to find out! Powering the Honda CB Shine is a 124.73 cc single cylinder, air cooled engine that is capable of developing 10.16 bhp at 7,500 rpm and a peak torque of 10.30 Nm at 5,500 rpm. This engine is compliant with Bharat Stage – IV emission norms and is mated to a 5-speed gearbox. The CB Shine offers linear power delivery, with enough grunt in the lower rpm range. This results in the bike being agile enough to accelerate from a standstill without any issues. However, the bike is clearly engineered for city use, which results in a weaker power delivery in the higher end of the engine rpm range. The CB Shine is thus in its best shape while being ridden up to speeds of 60 km/h. Noise, vibration, and harshness (NVH) levels are fairly contained, especially in the lower rpm range. However, once the bike crosses the 80 km/h speed mark, the engine starts to feel a bit strained. At such high speeds, there is a fairly noticeable vibration on the handlebars and foot pegs. Braking setup on the Honda CB Shine includes 130 mm drum brakes at the rear, while the front gets either a 130 mm drum or a 240 mm disc brake, depending on the variant. This, along with Honda’s patented Combi-Braking System (CBS) with equalizer helps in providing a satisfactory braking experience to the rider. The brakes offer good bite and feedback, though the absence of ABS (anti-lock braking system) can cause them to lock during emergency braking maneuvers. Suspension duties are handled by telescopic forks at the front and a spring loaded hydraulic unit with 5-step adjustment at the rear. The suspension has been tuned to absorb minor road undulations and potholes with ease, thus insulating the rider from any shocks. Being a budget oriented commuter motorcycle, the Honda CB Shine doesn’t get any significant convenience or safety features. The motorcycle comes with Honda’s patented Combi-Braking System (CBS) that automatically modulates front and rear brake pressures, even when the rider presses a single brake lever. This helps in distributing the braking load on both tyres, thus minimizing the risk of skidding or losing control. 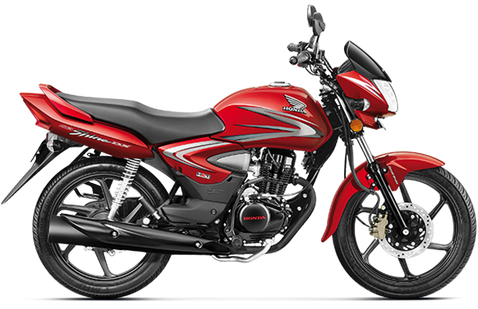 All variants of the CB Shine come with tubeless tyres, which reduce chances of sudden deflation while riding. The engine’s power is delivered to the rear wheel through a special seal chain, which Honda claims to have designed to require low maintenance. Overall, the Honda CB Shine ticks all the right boxes in a commuter motorcycle buyer’s wish list and comes at the right price. This combination makes it a value for money offering in this segment, which is a chief reason behind the bike’s popularity in the Indian market.